The use of biology to develop technologies and products for the welfare of human beings is known as Biotechnology. It has various applications in different fields such as Therapeutics, Diagnostics, Processed Food, Waste Management, Energy Production, Genetically Modified Crops etc. 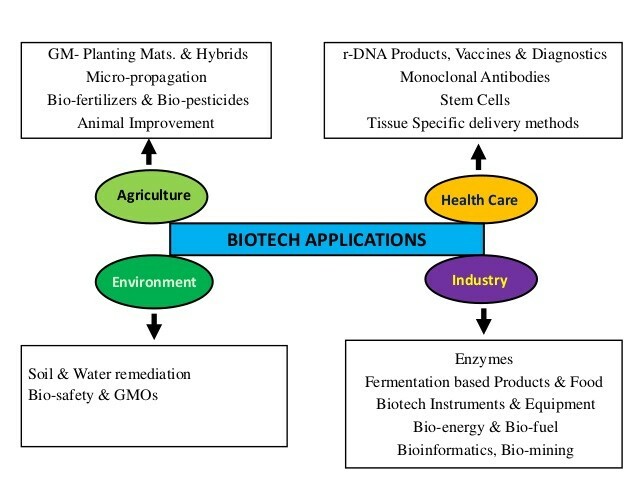 The use of Biotechnology in Agriculture is known as Green Biotechnology. Biotechnology had contributed a lot towards the upliftment of agriculture. The organisms formed after manipulation of genes is known as Genetically Modified Organisms such as Crops, Animals, Plants, Fungi, Bacteria etc. Genetically modified crops are formed by manipulation of DNA to introduce new trait into the crops. These manipulations are done to introduce traits such as pest resistance, insect resistance, weed resistance etc. For Example: Bt. Cotton. Bacillus thuringiensis is a bacterium that produces an endotoxin which is insecticidal. This toxin when taken in by an insect, the insect get paralyzed and dies off. The gene responsible for producing endotoxin is isolated and inserted into the genome of the cotton plant. This prevents the cotton plant from the attack of the insects. A nematode known as Melodegyne incognitia infects the roots to the tobacco plant. This reduces the yield of the plant. To prevent this, RNA interference strategy is used. This uses a complementary RNA that degrades the mRNA of nematode responsible for infection in roots of the tobacco plant. The use of biotechnology in medicine is known as Medicinal Biotechnology. This helps in formation of genetically modified insulin known as humulin. This helps in treatment of large number of diabetes patients. Biotechnology has given rise to a technique known as gene therapy. Gene therapy is a technique to remove genetic defect in embryo or child. This technique involves transfer of a normal gene that works over non-functional gene. It helps in disease diagnosis by various techniques such as ELISA, PCR etc. ELISA (Enzyme Linked Immunosorbent Assay) is based on antigen and antibody reaction to detect different diseases. PCR (Polymerase Chain Reaction) is technique to amplify specific DNA segment. This helps to detect HIV in AIDS patients. It helps in improving the quality and quantity of fishes. Through biotechnology, fishes are induced to breed via gonadotropin releasing hormone. 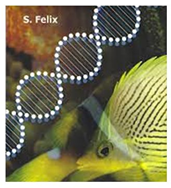 Animals that have their DNA manipulated are known as Transgenic Animals. For Example: Rats, Rabbits, Pigs, Sheep etc. These animals help to understand how genes are regulated and how they help in development of animals. It helps to study how genes are responsible for the development of various diseases. Transgenic Animals have foreign gene inserted deliberately into their Genome. This Foreign Gene is inserted into pronuclei of fertilized egg. This fertilized egg is then inserted into the surrogate mother whose uterus is activated artificially, to implant the fertilized egg. Such mother is known as Surrogate Mother. The mother give birth to genetically modified organisms. For Example: Dolly was a female domestic sheep and the first animal to be cloned from an adult somatic cell. Plants are used to develop antibiotics for Humans as well as for Animal use. It helps in production of antibiotics, vaccines and artificial hormones for hormone therapies. Edible Vaccines are mucosal-targeted vaccines, which cause stimulation of both systematic and mucosal immune response. Edible vaccines hold great promise as a cost-effective, easy-to-administer, easy-to-store and fail-safe readily acceptable vaccine delivery system, especially for the poor developing countries. It involves introduction of selected desired genes into plants and then inducing these altered plants to manufacture the encoded proteins. Edible vaccines are being developed for various diseases, such as Measles, Cholera and Hepatitis B, and many more are in the process of development.